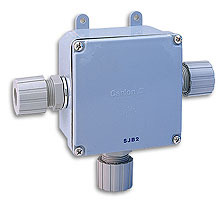 The SBJ Series summing junction box electronically sums the outputs of bridge type load cells to form a single output equal to the sum of the loads on each load cell. Potentiometers in series with the bridge excitation are provided to match the outputs of the load cell. Commonly used in industrial scales, bin, tank, hopper and platform applications. The load cell should be of the same capacity and have output interchangeability of better than 3%.